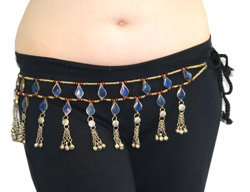 Handmade Afghani decorative belt with teardrop lapis and bell dangles. Handmade Afghani decorative belt with teardrop lapis and bell dangles. Perfect for tribal costuming and even looks great with jeans! Each piece is unique and may vary slightly from photo. Appox. 50 inches long, designed section is approx 36 inches.